The CLXC-C1-20D-C-S-CM Cold Water Meter is a single-jet dry type totalizing water meter with a pulse output of 1 pulse per gallon. 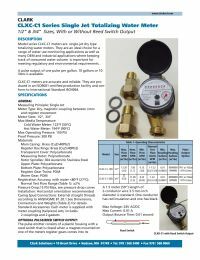 These accurate and reliable meters are an ideal choice for a range of sub-metering applications for apartment and commercial buildings, as well as marinas, RV and camping parks. It is highly recommended to install it at a horizontal orientation. Each meter is supplied with a meter coupling (tailpiece) set, which includes 2 couplings and 2 gaskets. 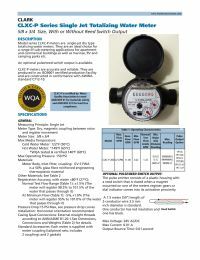 This meter offers a quality and reliable water meter at an affordable price compared to alternative water meters on the market. In addition to be an economical choice, having a water meter installed can also save you money on your water bill by allowing you to be charged only for the water you use, and making you more aware of your water usage.